2018 was a great year for us here. Have a look at some of our favorite highlights IN TECHNICOLOR! It was the morning of December 13th. I was in the midst of the holiday season with numerous events each week and I receive an inquiry for an event THAT EVENING. A few moments later I’m speaking with the client who informs me that due to a scheduling conflict, they lost their casino vendor and they’re stressed with no entertainment. One of my favorite events this holiday season was an awards luncheon for a local construction firm. I had met the CEO at another event, we hit it off and kept in touch. In our discussions leading up the the event, I was told that due to the size of their operation and numerous simultaneous job sites, they may not all know each other. This would be the only opportunity to have everyone in one together in one room to celebrate achievement. My job then, was not only to break-the-ice but create rapport and connections between people who have never met. Clearly, it would begin during the cocktail reception where I can get to know them a bit and help break the ice with close-up magic. After lunch, I would be officially introduced as host of the company’s awards ceremony. I went on to introduce some of the company officers who presented a total of six awards to employees. But there had to be more magic. We needed to bring more rapport and levity to the event. Awards were presented to reflect each of their company values, which included Excellence, Commitment, Positivity, Ownership, Improvement, and Teamwork. So, I created three customized piece of magic specifically for this event that I peppered throughout the ceremony and we had a blast. 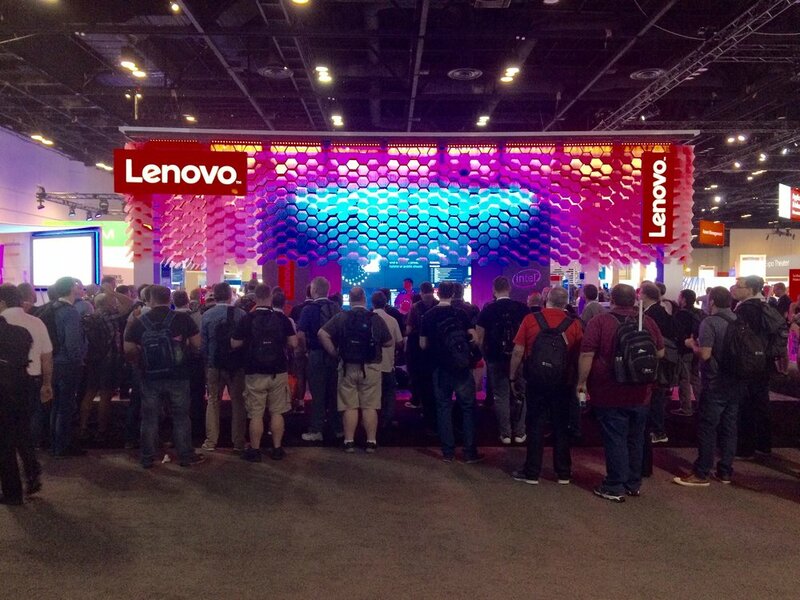 A few words from the Founder and CEO about the experience…. I can officially announce that my magic has taken me around the world. In July 2018, my friends at Magnet Productions sent me Shanghai to build crowds for their client at Mobile World Congress, one of the world’s largest consumer trade shows in the world. Did I mention it was in Shanghai and only 5% of attendees spoke English? And yet, look at those crowds! 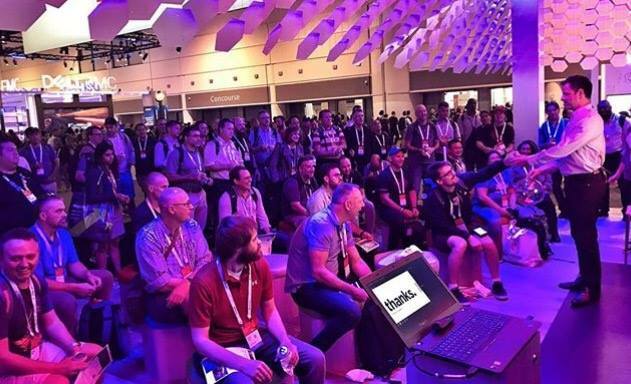 Other trade shows this year included MS Ignite and Cisco Live in Orlando, Blackhat and VM World in Las Vegas, and RSA, in San Francisco. I received an email from someone in England who’s son was graduating from Stanford and celebrating his birthday. She couldn’t be at his graduation party and she was inquiring about being a surprise guest for evening. She also asked if I could come up with a special surprise for him. Here’s a customized ending for one of my favorite pieces of card magic. In July, I was invited to entertain at a 60th birthday event in a cozy bungalow-style home in Santa Cruz. The evening with began in the backyard patio as I mingled with about 50 guests and entertained with close-up magic. We then sat down for dinner catered by a local taco truck. Everything was homemade and just delicious. While we ate, the backyard patio was transformed into a cozy theater and once guests finished their meal, they returned for my after-dinner mind reading show as the sun set. It was the perfect evening for mystery and wonder under the stars. 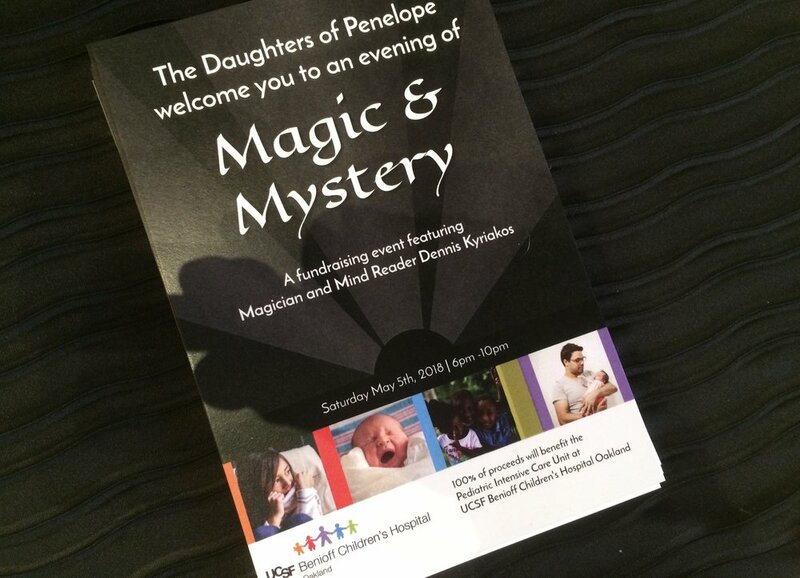 On May 5th, I participated in a fundraiser gala benefiting the Pediatric Intensive Care Unit at UCSF Benioff Children’s Hospital Oakland, hosted by the Daughters of Penelope at Ascension Greek Orthodox Church —which is just steps away from my home. The evening offered delicious appetizers — us Greeks know how to cook! — a silent auction, and a no-host bar. After cocktails, guests settled into their seats for my full 90-minute theatrical mind reading show, where I debuted brand new performance material. We raised over $7,000 that evening with 100% of the proceeds going directly to UCSF Benioff Children’s Hospital. If you’re planning a fundraiser for your favorite charity, I encourage you to be in touch. We can make it a truly magical event! Thanks to everyone who invited me to be part of their festivities. I would not be here without you and I’m grateful for the opportunity to share my passion. And thank you for reading. Have a happy and healthy 2019. Thrilled to be recognized as the "Best of the Industry" for Entertainment by the Silicon Valley Chapter of the National Association for Catering and Events. Back when my company was known as Miracle Magic Entertainment. The stage is set! Mentalism performance for a 60th birthday party at the Sir Francis Drake Hotel in San Francisco. Most of the audience flew in from Chicago that afternoon to surprise the guest of honor. Opening reception for corporate conference in Sonoma. An intimate fundraising event in our home for my son's elementary school. Couples purchased tickets to an evening of wine, cheese, and magic. 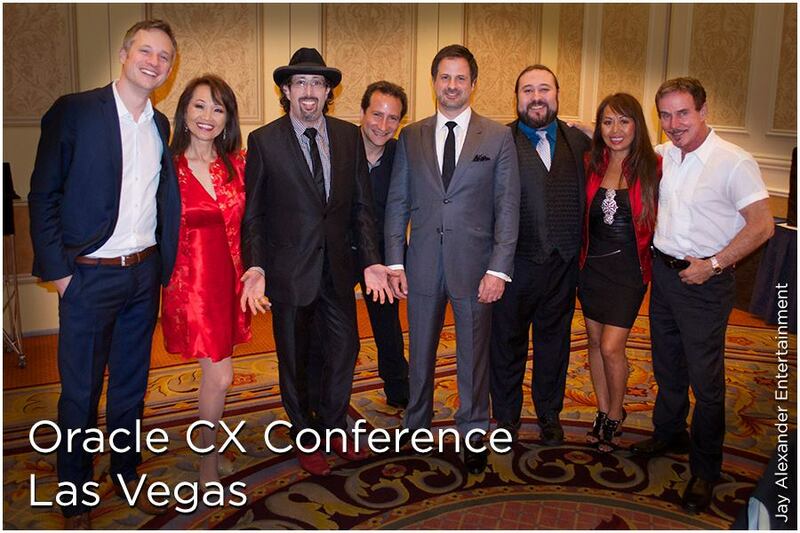 Watch this blog for more magic in 2016!